The sound cushions are an exploration of slow craft techniques combined with eTextiles. 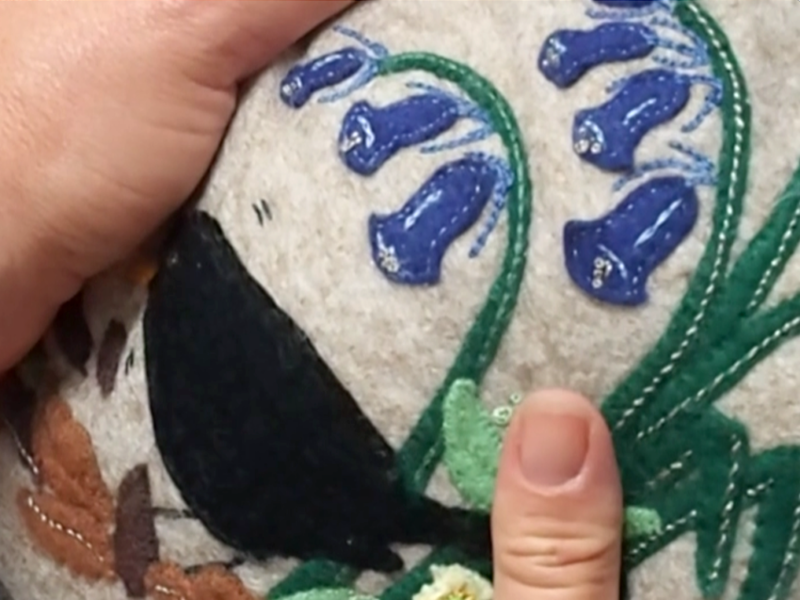 Created with the Penryn community craft group over 6 weeks, the surfaces were hand stitched with appliquéd felt and conductive fabric and thread. The group were inspired by nature in the designs chosen for their work, particularly animals and plants that had meaning to them. Working in conductive materials within the surfaces enables digital possibilities in the textiles. In this case we decided to play different sounds when touched or squeezed. Sounds were chosen by the participants relating to the images they’d created or samples from music they enjoyed. The group were encouraged to personalise their work, creating a wide variety of designs that were unique to the individual. This particular project challenged their imaginations and seemed to be particularly rewarding, all participants expressed pleasure at what they had made. The workshops revealed a personal approach to crafting, and a refined skill in manipulating the materials. As people explore the surfaces, they encounter layers of pattern, texture and sounds. Our research has shown that integrating additional sensory stimuli to the objects such as sound can deepen the experience.